As I said yesterday, no one does losing like the Pirates...and no one does multiple-OT games quite like the Penguins. Games like last night historically make household names out of Keith Primeau, Petr Nedved, and Petr Sykora (now that I think about it, there must be something about the name "Petr" in games like these). Unfortunately, we can now add Ottawa defenseman Matt "Two Goals in the Regular Season" Carkner to that eclectic list, as he scored his first goal of the 2010 postseason at 7:06 of the third overtime, buying the Senators another game and sending the series back to Ottawa for Game Six. Sens 4, Pens 3 in Triple OT. Yes, it certainly stings - but then again, I'd rather lose a game 4-3 than 20-0, given the choice of outcomes in Pittsburgh on Thursday. What disappointed fans the most (other than the missed opportunity to close out a series at home) was that the Pens admirably dug out of a 2-0 hole with goals from Kris Letang and Chris Kunitz. And Sidney Crosby continued his assault on the playoff scoring title, with a goal and an assist, giving him 13 points in five postseason games. But once that extra period hits in the playoffs, anything can happen, and you leave yourself open to one mistake ending the game with no chance for redemption. It goes without saying that the real mission is not to get to overtime in the first place. Panic is surely to set in to the more-edgy factions of Penguin Nation, most notably because of the play of scorching Senators goalie Pascal Leclaire on the heels of his 56-save performance. But there's a lot of hockey left to play, and who knows the toll that this game will take on individual players from both sides? There were 95 hits handed out between the two teams last night; each team had one player with over 40 minutes of ice time, with many others in the high 30s; and the goalies faced a combined 103 shots, each one testing their mental toughness. 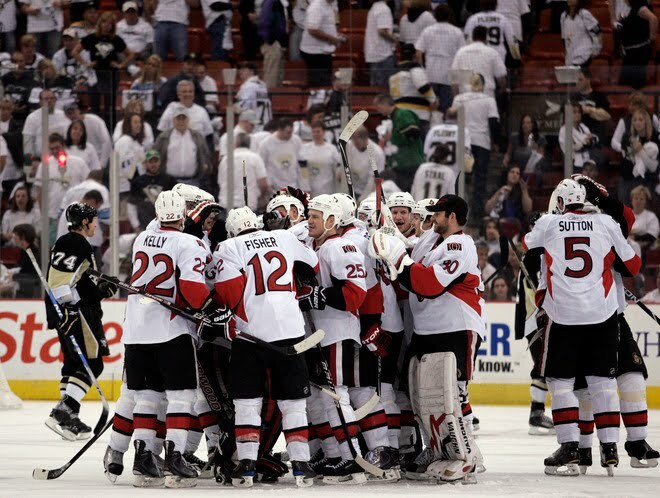 Where Game Six goes could depend solely on how quickly the teams' bodies - and minds - can get over Game Five, which was the longest game in this year's playoffs, the longest game in Senators history, and the second-longest game in Mellon Arena history. We'll find out in a little more than a day from now, as the tired bodies of two teams travel to Ottawa for a compelling Game Six on Saturday night at 7 p.m.
To those freaking out: Whose position would you rather be in, the Pens or Ottawa. I'm feeling pretty good about where the Pens are, still up a game and only have to win one out of two. I thought this series would go at least 6 games before it started, but it would be a nice change for the Pens to close these series out early when they have the chance. This reminds me a little of the Philly series last year. This is the exact same scenerio as the 08 Finals. Pens were down 3-1, win game 5 in triple OT on the road, and then lose the series at home in game 6. Hopefully history repeats itself tomorrow night. All of the history and cliches aside, the bottom line is that if we play the entire 60 minutes tomorrow like we did the 40 minutes in the 2nd and 3rd periods yesterday, LeClaire will only be able to bail them out for so long. The Senators had to play completely out of their minds in OT with their goalie standing on his head. It's not going to last. Ehhh, I'm still thinking this series has a more than probable chance of going 7 games. The Sens are feeling pretty good about themselves right now for weathering the onslaught in the 2nd and 3rd periods and still coming out of it with a win and if the Pens D allows the Sens to loiter in their end early on and throw pucks at the net unchallenged again it could be another quick hole they have to dig out of. Not too confident about the Pens PP and PK right now either. The Sens are clicking at over 40% right now and the Pens PP have failed to even get a shot on goal at crucial moments last night, so they'll need a very strong special teams effort to close this out in 6. Every one of our forwards is playing well right now but our D is the main concern, as Goligoski and Gonchar's play are not close to where it needs to be. To the contrary, Eaton has been very good. I agree that the PK has got to be better. I think that some of the situational stats need to be taken into consideration as well: they got 2 PPG on EXTENDED 5 on 3's and that ridiculous bounce in game 1 off the glass was a PPG. That would still lead giving up 4 PPG in 5 games.... not great at all. The one thing that bothers me is that Guerin will throw the puck on net anytime he approaches the blue line 5 on 5 instead of getting it deep, but on the PP he is pass first. I understand cycling on the PP to get a better look, but sometimes I think we are too concerned with getting a perfect shot instead of throwing pucks and bodies to the net. and everybody at thePensblog would be jumping on my back because I just suggested we need to take more shots on the PP, which clearly means I don't know anything about hockey. But I do think that you have to score to win and you have to shoot to score and in the NHL playoffs, a goal is a goal. Be it a beautiful wrister off of a perfect setup or a deflection off your shinpads via a weird angle shot from below the goal line, you take 'em any way you can get 'em. I'm sure someone will correct me but did I hear that the Sens have converted on 7 out of 17 power plays? If so, that's horrible. 5 on 5 they're doing great most of the time. But as others have said, the PP and the PK really need to play better because it's killing them.